InsuranceJobs.com, the leading insurance jobs and employment website for insurance professionals, offers an overview of key employment trends in the insurance industry for October 2013 based on preliminary statistics reported by the U.S. Bureau of Labor Statistics (BLS) in the monthly Employment Situation Economic Release. The U.S. Bureau of Labor Statistics released a report November 8, 2013 announcing a .20 percent increase in the number of workers in the insurance industry from September 2013 – October 2013. The insurance industry now employs 2.373 million workers compared to 2.368 million in September 2013. These statistics from the U.S. Bureau of Labor Statistics are seasonally adjusted. All normal seasonally changes within the insurance industry have been discounted to provide exact monthly changes. Average hourly earnings for all insurance employees have steadily increased since July 2013 when they were $32.89 per hour. The latest recorded average hourly earnings from September 2013 peaked at $33.18. 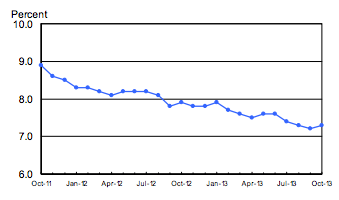 For nonsupervisory insurance employees the rate is much lower, reaching only $26.93 per hour in September 2013. This insurance industry has seen great progress since the start of 2013. The year marked a turning point for the unemployment rate within insurance industry. However the rate surged within the last month reaching 3.8 percent. That is up from an all-time low of 2.5 percent in August. The growing unemployment rate among insurance professionals is cause for concern. As the number of those employed in the insurance industry continues to grow, InsuranceJobs.com predicts jobs for current insurance professionals who are unemployed will increase. InsurnanceJobs.com has not experienced any decrease in the number of job posting for seasoned insurance professionals.